Published in the Finnish online magazine fifi/voima in Finnish. On the day of the earthquake I slept in after working late the night before. I didn’t hear about it on the news. Instead I got an e-mail from my mother saying the Presidential Palace had collapsed. My mother wrote that she was in shock… I didn’t understand until I saw the news. From that moment on it was like I was paralyzed. I couldn’t concentrate on anything but the news, which I read nonstop. It is terribly hard to believe what happened in Haiti last week, and to grasp the true scale of the destruction. I read that the quake could be compared to the effects of several nuclear bombs, it was powerful and its centre was not very deep, a combination that made it particularly dangerous. How can such a small country of 27,000 km2 with ten million inhabitants withstand such impacts? Poverty means that few houses are properly constructed. From one minute to the next Haiti was hurled back into the Middle Ages. Right now countless people are buried under collapsed buildings. Help will never reach them, or if it does, it will probably be too late; and some will never be found. Many have been cremated and buried anonymously in mass graves. Those who have survived are trying to come to terms with the tragedy, while having to deal with practical matters: finding water, food and medical assistance. The Red Cross estimates that about three million people – almost one-third of Haiti's population – have been affected by the quake. Why did this have to happen? Haiti’s political situation has been extremely precarious for a long time. Haitians have also had to cope with annual floods. People have been forced to flee the flood waters on the roofs of their houses – and now an uncountable number of homes have been damaged so badly that they are uninhabitable. Soon the rainy season will start again and the chaos will get even worse. My grandfather, the painter Geo Remponeau, fled Haiti for New York with his family during the Papa Doc era. Life under the dictatorship in the 1960s had become too dangerous. His best friend, my mother’s godfather, had died at the hands of the paramilitary Tonton Macoutes. My parents met in New York at the beginning of the 1970s. They moved to Switzerland, my father’s home country. In my own art I have worked on my relationship with my Haitian roots. I have family in Port-au-Prince. I also knew that some of my relatives had gone there for a funeral just a few days before the earthquake. From messages on my New York family’s Facebook pages I built up an image of what had happened. We were lucky: after the first quake our relatives were able to call New York to say they were well and to warn that they would most probably not be able to call again due to the overloaded phone system. Three days later the funeral visitors were able to fly back to the States with the US military. Gladys, who had been on the trip, told me that when the catastrophe struck she had been in a house in Petion Ville. The quake shook the house with great force, but by some miracle the building remained standing. A moment later the survivors were on the streets looking for their loved ones beneath the debris, digging through the rubble with their bare hands. People sleeping outdoors prayed and chanted. One local cousin of my mother, who has diabetes, was rescued from a collapsed house after 18 hours with a broken arm. We have not yet heard from some family friends. Being so far away makes me feel helpless. I immediately donated money and have encouraged others to do the same. Haiti needs help more than ever before, and that need will continue for a long time. One very good NGO that I just heard of is Partners in Health and then, of course, there is Doctors Without Borders. 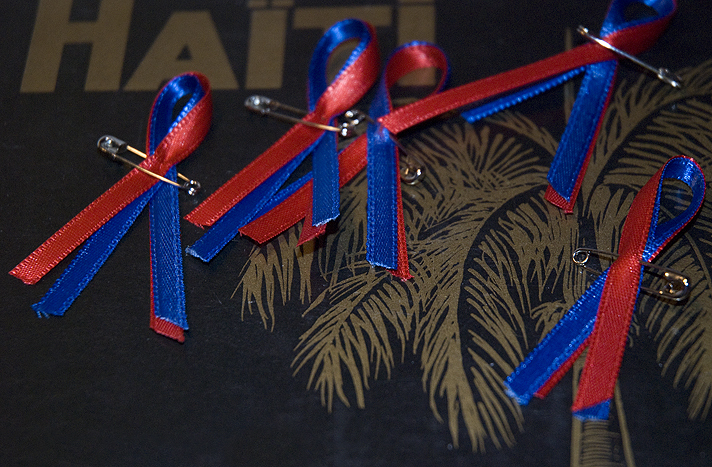 On the Friday, 15.2, I started making Haiti solidarity ribbons in blue and red – the colours of the Haitian flag – as a present to family, friends and who ever cares about Haiti. If you want one of the ribbons, just e-mail me your postal address and I will send you one. I know that in such situations people only remember the tragedy for as long as the media talks about it, and turn their attention elsewhere once the cameras leave. Nevertheless many of the greatest challenges will only emerge later. I hope that people will not forget Haiti. What do I have left of Haiti? A few memories from my childhood. The scar on my forehead that I got in a minor accident when I was visiting Haiti with my family when I was six. As an adult I have never managed to return: it would have been too dangerous, as my family always used to warn me. Now, I regret that I did not go, but I'm certain that one day I will return. However, I think Haiti will never be the same again; and that its people have changed. But as my aunt Jany told me, the architecture will change, but the spirit is anchored deep in our ancestral roots, so what it means to be Haitian is within us, and will survive.